Finally Carl Edwards was not the guy at the top of the scoring pylon… However it may have only been because of the fact that he didn’t turn any laps during the next-to-last practice session of the weekend for the NASCAR Nationwide Series. You can’t blame Edwards for not attempting to log any more laps. He already knows he has a strong racecar, and the uncertainty of the right side tires (which NASCAR said they are scrapping in favor of a more reliable compound) so why chance it? While Edwards’ No. 60 Scott’s Mustang sat, the rest of the field attempted to close the gap on him. 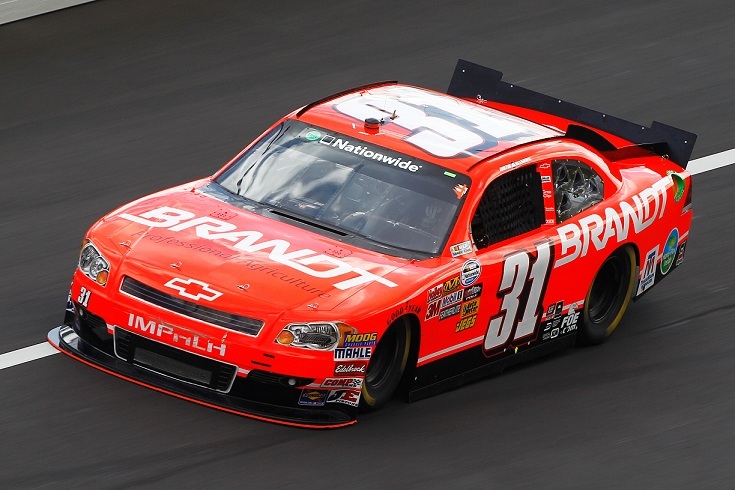 Justin Allgaier, who got his first and to date only Nationwide Series win in this very race last season led the session with a lap of 123.348 mph. That lap was good enough to narrowly edge out his Turner Motorsports teammate Jason Leffler. Kyle Busch was third fastest followed by Kevin Harvick and Aric Almirola. Earlier in the day Elliott Sadler was a casualty of a right side tire compound that will be swapped out tonight by Goodyear. Kevin Lepage joined that list with Sadler in this session as he cut his right front tire, which sent him hard into the wall destroying his No. 24 Ford Mustang. Lepage was 12th-fastest when the tire let go, so needless to say it is a huge blow to a team that needs to qualify on time to make it into this field. Sadler turned the seventh fastest time in his backup car. The NASCAR Nationwide Series point leader Reed Sorenson turned in about the same result as every practice session thus far. He was 21st quickest in this practice. Danica Patrick has been soaking up advice from her driving coach Johnny Benson like a spongue. She is making her first run here at Bristol Motor Speedway, and is having an issue with the steering wheel in her car. According to her the wheel is blocking her view of other cars in front of her, so the team is looking at changes to help on that front. Patrick was 25th in the third session of the day. Nationwide Series final practice will get underway at 5:00 PM ET, you can catch all of that action on Speed Channel. Brisbane Automatic Garage Door Openers is an Australian owned and operated business with over 40 years combined experience in the garage door industry.